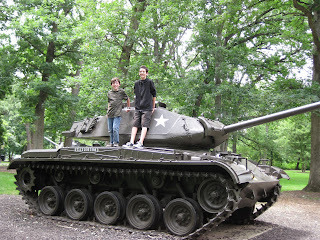 When we visited Cantigny Park earlier in the month I promised the kids we would come back for the birthday celebration. Well today we spent the day soaking up all kinds of history. 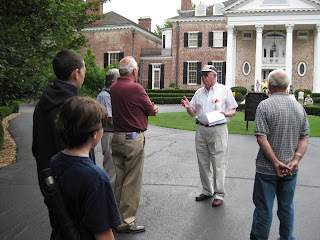 We started our day at the McCormick Museum with a guided architectural tour. Then we were led on a one hour tour of the inside of this beautiful mansion. It contains 35 rooms, 13 bathrooms, a movie theater, and a formal dining room with walls covered with hand painted rice paper wallpaper from China. The three of us agreed the most impressive item in the mansion for us was the collection of over 5,000 first edition books of which the majority are signed by their respective authors. Next up was the First Division Museum. They had tons of artifacts(vehicles, tents, clothing) from WWI, WWII, and the Korean and Vietnam Wars set up for today's open house. Then we took an artillery tour. 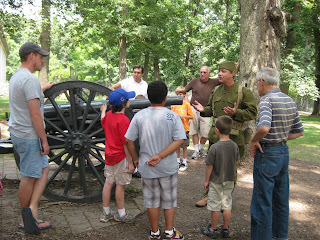 Our guide wore authentic WWI attire and explained the history of the different cannons located on the grounds. On the grounds they also had vintage 1890's children's games set up, a neat display of vintage farm implements and free ice cream and birthday cake. 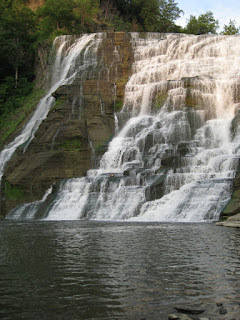 We spent a fantastic week in Ithaca,NY. With over 100 gorges and waterfalls within 10 miles of downtown we sometimes question why we ever moved to the cornfields of Illinois. It's hard to believe it has been 15 years since graduation. It sure doesn't feel like it's been that long. 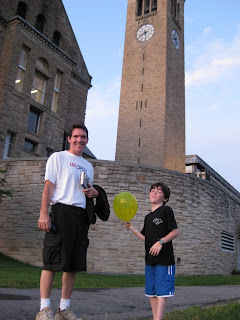 The kids spent the week at summer camp up on Cornell's campus. 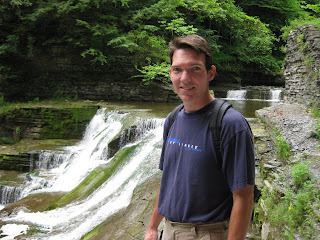 Husband and I spent the week hiking the gorges and relaxing beside some beautiful waterfalls. The hardest part of the trip was making the drive. It's almost 1500 miles round-trip. I love the mpg in our Prius but it's not the most comfortable car. Especially with 2 adults, 2 kids, a week worth's of clothes/stuff, and a new furry family member. Meet Eleanor(we call her Ellie). 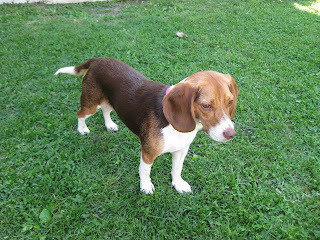 We've been looking to adopt another dog for about 8 months. I was looking for a yellow lab but after meeting with several and being realistic about the space available in our abode Ellie seemed like the perfect fit. She is a year old and weighs about 20 lbs. She has been living with my Aunt for the past year but she puts in long hours at her job and she wanted Ellie to be able to enjoy life outside a crate. 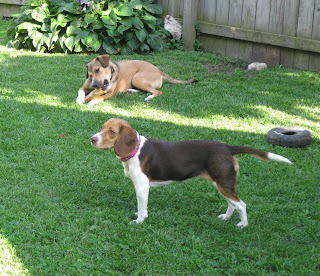 Baxter seems to think having another playmate is fantastic too. Yep, Another year has flown by and that means another birthday is upon me. 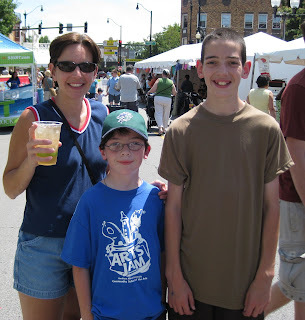 My sweetie planned out a day adventure in Chicago to help me celebrate. Our first stop was a music shop to pick out a new violin. Unfortunately I didn't find anything I wanted to purchase. Not too far away was a music festival we went to check out. We were just in time to hear the play offs for the Midwest Fiddle Championship. 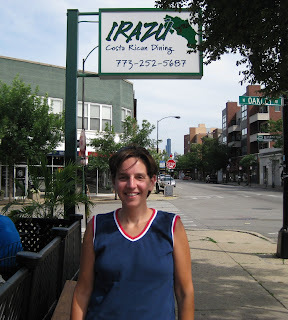 Next up was lunch at at a Costa Rican restaraunt-Irazu. The food tasted fresh and delicious! 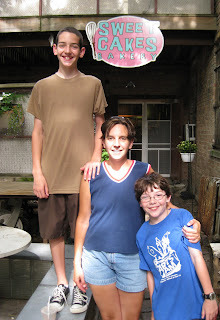 If you're going to celebrate a birthday you need cake so the next stop was a yummy bakery. He planned to take me to a bunch of fabric and yarn stops along the way but we ran out of time and they were all closed by the time we made our way around the traffic. We stopped at another music store on our way home and spent a couple of hours tinkering on guitar's and bass's. Now I have a mandolin, guitar, bass, and violin to add to my wish list. My neighbors are going to love me! Wow-It's July. Where did June go? 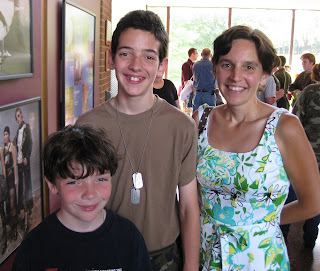 Both of my kids attended separate theater camps during June. The month was filled with carting kids to different places at different hours of the day. It was the first full length musical for my eldest. He had a fantastic time with 60 other young thespians putting together Miss Saigon with only 2 weeks of rehearsals. 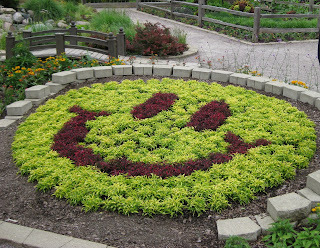 I found out about a very unique 500 acre park only 40 miles from our home so we went to check it out. 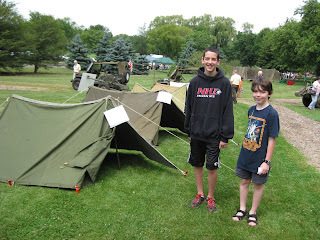 There are two history-rich museums in the park: the Robert R. McCormick Museum and the Cantigny First Division Museum. The First Division Museum contains over 10,000 items from every war and conflict from the Revolutionary War to Desert Storm. It's like having a Smithsonian in our backyard. Surrounding the First Division Museum they have 10 tanks on display. It's no surprise as to which part of the park were my kid's favorite. I fell in love with the gardens. A little bit of "peace" on earth after touring the war history museum. 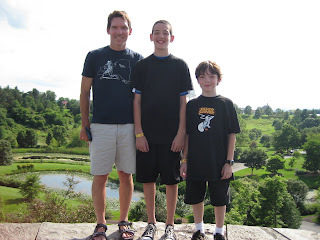 We are headed back to this park at the end of July for their birthday celebration. Complete with cake and ice cream, 19th century games, farm animals and period farming equipment, and the kid's favorite-backyard ballistics.